There has been little change in fox numbers in Britain in the past 25 years, according to a study in the Journal of Applied Ecology. A team of scientists and volunteers counted fox faeces from over 400 1km-squared sample sites across the UK to make their calculations. The final figure - of 258,000 - has hardly changed since a similar survey was carried out in 1981. The International Fund for Animal Welfare (Ifaw) funded the study. By combining the number of faeces found in each site with estimates of the number of faeces a fox produces each day and the proportion of faeces that can be found during field surveys, the researchers could make their deductions. Study leader Professor Stephen Harris, of the Mammal Research Unit at the University of Bristol, UK, described the figures as something of a "guesstimate". But they agree with results gained from studies carried out in previous years, which used different methods. From 1981 onwards, several surveys have put the total at around the quarter of a million mark. Of the latest figure, 225,000 of the foxes inhabit rural areas of Britain, says the study. The remaining 33,000 live in urban locations. By itself, Ifaw says the survey does not show whether fox numbers would increase if people stopped hunting them. However it claims another study, which it also funded with the Royal Society for the Protection of Animals (RSPCA) and published in Nature, shows there was no change in fox numbers when hunting was suspended for nearly a year during the foot-and-mouth epidemic in 2001. Ifaw campaigner Josey Sharrad, said: "This research demolishes arguments by the hunting lobby that foxes need to be killed to prevent a population explosion. It will also allow us to monitor the impact of a ban on this cruel sport." But this argument drew derision from Tim Bonner, the head of the Countryside Alliance group in the UK. "These figures come as no surprise," said Mr Bonner. "All that this research does is prove that the present controls for managing wildlife are effective at maintaining sustainable populations. "We do not claim that hunting on its own can control the UK fox population," he told BBC News Online. "There is no link between this research and political arguments for or against hunting." 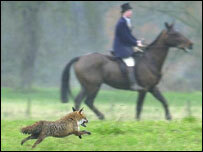 Professor Harris said he did not think that a ban on fox hunting would affect fox populations in Britain. "The number of foxes killed by hunts each year is minuscule," Professor Harris told BBC News online. "Foxes regulate their numbers very effectively. 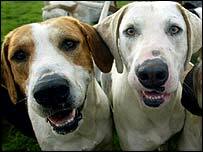 WHAT FUTURE FOR THE HOUNDS? "If you kill lots of foxes, they produce more cubs. Likewise if numbers are high, females will slow down breeding. "However, it is important to have a method of accurately counting foxes should a ban come in," said Professor Harris. "If we have a precise method of monitoring foxes, we can make sure numbers don't rise. "We don't want too many foxes, as they do deplete numbers of other animals." 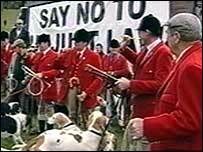 In July of this year, Commons leader Peter Hain hinted that the government would move to ban fox hunting by Christmas.